We hijack their voices before they are old enough to form their own opinions, exploiting their cuteness or creating shock value by inserting an innocent child into a messy adult debate. In the wake of recent shock videos purporting to “prove” that Planned Parenthood sells aborted body parts, social media has erupted once again with over-the-top right wing indignation. Doc Watson’s Facebook page posted this meme with a picture of a young child wearing a lion’s costume and the caption “If I Dress Like A Lion, Will You Save Me from Planned Parenthood?” I assume the intent is to shame us liberals by pointing out the supposed hypocrisy of caring about Cecil the Lion’s death even as we support a woman’s right to choose. But for me, the only shame provoked by the posting is that we have become a society that uses our children as billboards. We hijack their voices before they are old enough to form their own opinions, exploiting their cuteness or creating shock value by inserting an innocent child into a messy adult debate. The pro-life movement is the worst offender. The latest meme is relatively benign compared to examples like this young girl displaying a gruesome photo of a fetus or these boys sent out to proclaim baby murder. In the latter photo, it appears the children have been so desensitized to the pro-life rhetoric that they greet the threat of baby murder with boredom. My partner and I will never ask Bobby to advocate for us, and that includes passive advocacy like wearing a gay pride T-shirt. Our emphasis is on providing him with a family structure that makes him feel safe and allows for his self-actualization. Until outside circumstances force the discussion, we are not going to compromise his childhood by burdening him with the harsh realities of homophobia, nor are we going to steal his voice by putting him in clothing that preaches a message he does not understand. The classic counter-argument to my criticism is that parents have the right and obligation to teach their children morality. I agree. However, what is lost in that argument is the notion that there is a huge difference between a discussion about right and wrong that takes place between a parent and child in private, and a parent forcing a child to publicly espouse beliefs they are far too young to independently comprehend. We cannot forever shelter our son from the reality that some people are against our family’s existence. When the time comes for conversation we will use the opportunity to reinforce his appreciation of all kinds of family diversity. For my partner and me, that is a critical value we wish to impart. Beyond that, if Bobby ever wears a gay pride T-shirt or marches in a parade, it will be because he chooses to publicly align himself with the gay pride movement. We draw the line for a couple of reasons. First of all, as the adults in the family, it is our job to deal with any discrimination. Bobby doesn’t need that burden. Second of all, as he moves forward in his life, Bobby may find that being the son of two lesbians is just not a big deal to him. He may care more about another issue. We want an accepting son who cares about other people—the details are for him to discover. The issue of self-determination has made me backtrack in an area where I did once involve my son in advocacy. Bobby has Down syndrome. I am an extremely proud mother to this boy and often sing his praises on social media. Because of this, we were approached by a Down syndrome organization that creates memes designed to change perceptions about the disability. They circulated a picture of our family on social media, proclaiming “My Mothers Know the Gift I Am.” At the time, I had no second thoughts about his picture being used because it was advocacy for Bobby. But that was a mistake. As his mother, I rightfully advocate for his education, medical needs, and general inclusion in the world. 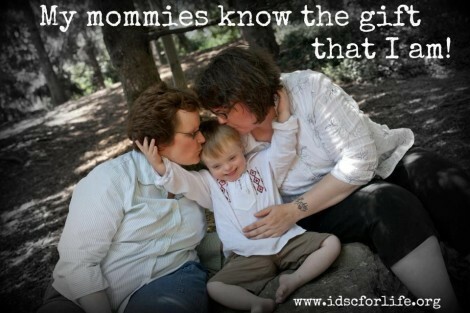 I do not feel I overextend my involvement by writing about my experience of mothering a child with Down syndrome. But when it comes to molding the general perception of what Down syndrome is, I need to defer to Bobby. I don’t have the right to force his chromosomal defect to be his central defining characteristic. I don’t have the capacity to know what his diagnosis means to him. He needs to write his own story. Instead of using him as a conduit to expressing my own opinion, I need to stay out of his way.